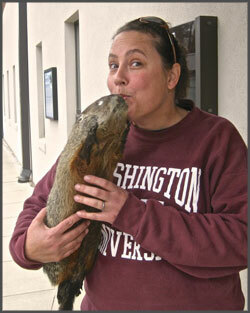 February is upon us, and Nikki Castleberry consoles Woody, the Museum’s own groundhog. Yes, Woody is likely to see his shadow. We’ll doubtless get six more weeks of winter, regardless. Up on Freeman Ridge the spring peepers are calling, telling us to take heart. We’re getting a nice warm start to the month, and that brings along its own worries. Just what we need! Now’s a good time, when the leaves are off the trees, to get ready for those little biters. Have you got your gutters cleaned out? The little Aedes ladies love a water-filled rain gutter. Now, while the leaves are off the trees, is a good time to check the back yard environs. Empty any old containers that hold some of the abundant rain we’ve had this winter. Black Rock Mountain Field trip. This excursion is planned for May 6-8, and the list is filling up fast! If you’d like to participate and check out this beautiful display of spring flora, contact Robert Wyatt (rewyatt@uga.edu) before it’s too late. The Friends of the Georgia Museum of Natural History’s winter Board meeting is scheduled for February 9th. Suggestions, ideas, concerns, contact me, soilmite@earthlink.net or (706) 543-0639. Would you like to serve on the Friend’s Board? Let me know.